Cloud computing has changed how many businesses handle their internal IT operations, and consequently this has had a huge impact on the world of IT professionals. In the past, someone pursuing a career in this field would join a company’s IT department and perform many of the tasks that are now assigned to third-party cloud providers. However, even though IT professionals don’t have the same responsibilities that they once did, they’re far from obsolete. Today’s IT departments simply serve a different purpose. Since many companies are no longer storing and managing all of their data in-house, fewer system administrators are necessary. IT professionals who once filled these roles must either fight for the few remaining positions or find other ways to serve the business. When a company works with a third-party cloud provider, it relies on its IT professionals to serve as the liaison between the company and the provider. Only IT professionals can fully understand both the intricacies of the in-house storage systems and the cloud. No matter how much training they receive, employees who aren’t IT experts will encounter problems related to cloud storage from time to time. As a result, businesses now need IT professionals to provide support and assistance to employees as they work with the cloud on a daily basis. Very few businesses move all their data and applications into the cloud, and some still haven’t begun the process. Thus, it’s important for IT professionals to build a mixed skill set. The best IT professionals will be able to manage data using an in-house storage system, help a business make the move to the cloud and continue to assist with communication after the move is complete. Instead of focusing solely on data storage and management, spend some time studying cloud computing as well. Learn how to serve as a liaison between a company and its cloud storage provider, and understand how to facilitate interactions between a business’s existing infrastructure and a cloud storage system. 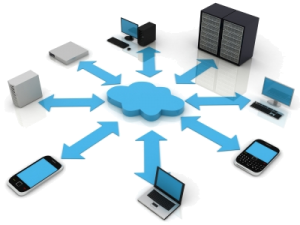 Recognize that cloud computing is a technology that continuously changes. Even if you know how it operates today, the system may be completely different in 10 years, so stay up to date on all the latest developments even after you’ve landed an IT position. In-house IT departments may not operate the same after cloud integration, but they’re still an integral part of any company. To ensure your IT career can move forward even in a world dominated by the cloud, get familiar with the changing needs of IT departments and make sure your skills and knowledge will fit well within this new role. If they don’t, take steps to adapt. Change is inevitable, but you can remain an in-demand commodity with the proper preparation.